From New York Times bestselling, award-winning author Ann Packer, a “tour de force family drama” (Elle) that explores the secrets and desires, the remnant wounds and saving graces of one California family, over the course of five decades. Years later, the three oldest Blair children, adults now and still living near the family home, are disrupted by the return of the youngest, whose sudden presence sets off a struggle over the family’s future. One by one, they tell their stories, which reveal Packer’s “great compassion for her characters, with their ancient injuries, their blundering desires. The way she tangles their perspectives perfectly, painfully captures the tumult of selves within a family” (MORE Magazine). Reviewers have praised Ann Packer’s “brilliant ear for character” (The New York Times Book Review) and her “naturalist’s vigilance for detail, so that her characters seem observed rather than invented” (The New Yorker). 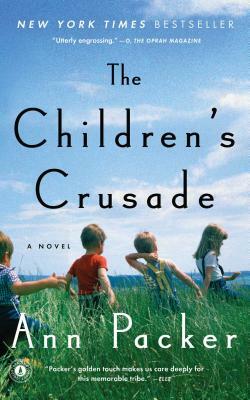 Her talents are on dazzling display in The Children’s Crusade, “an absorbing novel that celebrates family even as it catalogs its damages” (People, Book of the Week). This is a “superb storyteller” (San Francisco Chronicle), Ann Packer’s most deeply affecting book yet, “tragic and utterly engrossing” (O, The Oprah Magazine). Told in the most elegant prose... extraordinarily compassionate... A masterful portrait of indelible family bonds. "A flawless, compassionate portrayal... literary fiction at its finest." "An absorbing novel which celebrates family even as it catalogs its damages." "First-rate storytelling... Few writers are as emotionally astute at conveying subtle family ties as Packer." "A more ambitious work that succeeds beautifully. The beauty comes from the rich characterizations that make each of the Blairs spring to life. We do not like them all equally, but ultimately we come to know them equally... Packer’s dissection of domestic life reminds me of her elders in the field Anne Tyler and Louise Erdrich. But I’ve rarely read a novel so astute about the jumble of love and respect, rivalry and envy, empathy and scorn that makes up family dynamics. Packer is also a superb storyteller. “The Children’s Crusade” is as much plot-driven as character-driven. From its opening pages, the book seduces us into a world far from the present era, glides through ensuing decades, and finally drops us off in the 21st century." "Psychologically acute... provocative... Packer shows how unhappiness and happiness, selfishness and kindness, ricochet in complicated ways through relationships. This is a novel with something to teach about forgiving the people we love." "As the details accumulate, as each character’s story builds, Packer’s writing gains depth and power. By the end, all the separate threads weave a complex, textured tapestry. What a gift to the reader, who will certainly recognize and identify with the novel’s universal themes of those knotted ties that bind, the varied meanings of home, and, in particular, the many ways the child is father to the man." "Graceful, poignant... With her warm, nuanced portrayal of a family and its foibles, Packer delivers." "Packer's portrayal of one family's breakdown is tragic and utterly engrossing." "Packer has made complicated families her specialty... engaging writing, sense of place... The Children's Crusade [is] a journey worth taking." "Absorbing... the novel spreads its branches widely... fully formed heartbreaking portrayals." "A sublime and intelligent exploration of one family and its mythology of sorts... Ms. Packer is a wonderful portraitist, allowing childhood moments to unfold in all their riveting innocence (including a breathtakingly perfect, terribly sad music recital scene) and following the family as choices beget choices and lives intertwine or unwind... This entertaining,poetic novel layers a multitude of human contradictions, and what is most moving is that even with so much hostility and melancholy, the family story here is one of love. It is about how we return again and again to understand, to make things right, even as we seek to move on from ancient pain."